Sometimes we miss out on Mumbai’s beauty – especially if it’s not at eye-level. Though we might risk a bit of a neck-ache with this perspective, the city’s architecture is sometimes at its best above our heads. Mumbai’s best ceilings are modern, old, ornate, simple – and each one tells a story about our city. Here are some of my favourite ones. If ever a window was required to peep into the fascinating world of art and antiquities, the Chhatrapati Shivaji Maharaj Vastu Sangrahalaya, formerly known as the Prince of Wales Museum of Western India, at Mumbai, would be the right place to visit. The museum’s ceiling features the Indo-Saracenic style of architecture. Its façade is made of yellow and blue stones, mined from the Bombay region. It has an assortment of details from different Indian styles like small spherical cupolas on towers, saracenic arches with Muslim jalis as fillers, semi-open verandahs and jharokhas (windows) of Rajputs. Its dome has been designed deliberately, so as to append variety in the skyline and make for an iconic landmark at ground level. In the heart of Mumbai’s Byculla district lies the Dr Bhau Daji Lad Museum, a structure immersed in Indian history and culture. The main reason to visit Bhau Daji Lad Museum is for its architectural brilliance. As you wander inside the museum, the first impression is one of grandeur and brilliance, which is reflected in the facade of its ceiling as well. The ceiling has real 23.5 carat gold gilding, and one of the ships that had carried these tiles from England had sunk en-route. The ceiling is a beautiful shade of celadon green, a colour widely seen in 19th century European buildings. The ceiling is also embellished with stucco and stencil work. This temple is renowned among Jains for its beauty – and given how beautiful Jain temples are, that’s saying a lot. The ceiling is aglow in warmer, richer shades of the reds and depicts the signs of the zodiac. This beautifully decorated and adorned temple has an entrance flanked by two stone elephants. The downstairs area houses an array of deities and saints, including an image of Ganesh that recalls historical links between Jainism in Mumbai. As its name suggests, the temple is Lord Adishwar (also known as Rushabhdev), the first of 24 Jain “Tirthankaras” (special liberated souls who have attained omniscience, and guide other souls from the cycle of death and rebirth) of the current era. Architecturally, it has a narrow tall hall with vaulted ceilings and an impressive altar with three colorful strained glass windows with a chandelier hanging in the front. 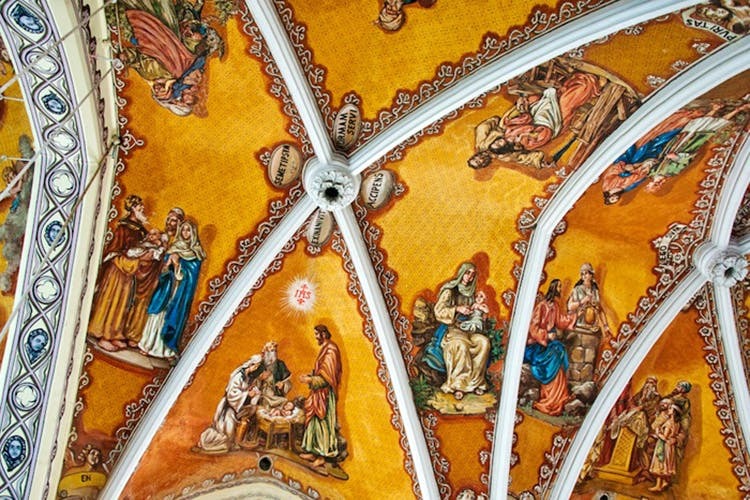 Ceilings in a rich yellow colour depict the scenes from Christ’s life. The white lines criss-crossing across the ceiling provide the outlines and create the sections while providing a pattern. Arches below have the frescos on a pale green background while the empty spaces are filled in yellow and pink with geometric designs. The whole play of bright yet pleasant colors is what makes this place vibrant and charming. There are idols on the walls that add to the beauty. Mumbai airport’s new state-of-the-art T2 terminal is an impressive engineering and architectural achievement. Designed by the New York office of globally leading architectural firm Skidmore, Owings & Merrill LLP (SOM) and built by India-based conglomerate GVK Power & Infrastructure Ltd. (GVK), it features a dramatic, technically complex and aesthetically breathtaking molded coffer ceiling inside the terminal, with integrated columns, as well as a striking retail corridor featuring perforated ceiling petals and skylights. The sheer scale and aesthetic impression of the ceiling and columns is difficult to appreciate unless you stand beneath it. The ceiling structure includes more than 4000 coffers, nearly 100 square feet each, and complex columns over 100 feet high. An architectural gem featuring a dramatic ceiling.